Yamaha is one brand that has always been associated with performance motorcycles in our country. From its two-stroke screamers to modern entry-level performance bikes, it has always given Indian bikers a dose of adrenaline. However, its portfolio in the recent past hasn't been performance-oriented, especially compared to its rivals, who have stepped up the ante. A good example of this is Yamaha's FZ series, which despite the sharp styling isn't sporty enough. Yamaha did retaliate with the R15 Version 3.0 and the bike has been well received by Indian bikers. However, the aggressive riding stance of the R15 isn't everyone's cup of tea and the Japanese brand has addressed it by riding in the MT-15. It's basically the naked version of the R15 and shares most of its underpinnings with it. So, as you can see, the baby MT has lot to deliver but it shocked many with its Rs 1.36 lakh (ex-showroom, Delhi) price tag. We got to ride Yamaha's latest street fighter at the BIC (Buddh International Circuit) racetrack and here's our initial impressions. 1. Punchy and powerful engine. 2. Gearbox offers crisp shifts. 3. Revised ergonomics adds comfort. 1. Brake feel isn’t great. 2. No option for dual-channel ABS. 3. Pricing is on the higher side. 4. Quality of plastics and switchgear is un-Yamaha. 1. The R15-sourced motor is refined and powerful. 2. Larger rear sprocket improves low- and mid-range performance. 3. Riding posture is upright and touring-friendly. Being a youth-centric motorcycle, the MT-15 has a sharp and edgy styling to woo youngsters. Unlike streetbikes of the past, which were bulky and big, the MT-15 has more athletic and compact proportions, like the Yamaha MT-09. The most eye-catching design element on the new bike has to be its transformer-like LED projector headlight with twin LED DRLs on top that endows the motorcycle with a menacing look. However, the lack of USD forks mean that the India-spec motorcycle misses out on that butch stance associated with the international-spec bike. On the positive side, the chiselled fuel tank and large fuel extensions with “MT” branding does give the new motorcycle a mass-forward visual appeal. Also, the single-seat unit looks like a floating unit with a slim LED tail light. The India-spec bike is equipped with saree guard and crude looking grab rails, or should I say a metal tube below the pillion seat, which is something most owners are likely to remove. Another eye-sore in an otherwise well executed design is the R15-sourced exhaust muffler. Quality is one aspect that Yamaha motorcycles in the recent past have been lacking and the MT-15, sadly, continues this tradition. On some of the media bikes the tank extensions were shaking, while the seat didn’t fit snugly close to the fuel tank. Additionally, some of the plastic panels looked and felt flimsy. Last but not least is the switchgear, whose quality is even poorer compared to the one found on the Yamaha R15. Given the asking price of the motorcycle and the reputation that brand Yamaha had for quality in India, disappointment is an understatement summing up the MT-15’s build quality. With every passing generation, the riding stance of the Yamaha R15 has gotten sportier. In fact, the Yamaha R15 V3.0’S ergonomics is sportier than even some of the performance supersports on sale in India. This was also one of the key reasons for many bikers staying away from the R15. Being a streetfighter, the Yamaha MT-15 has comfier ergos. The footpegs are more centre-set and lower, while the flat handlebar means that you sit in an upright and much more comfortable riding stance than its full-faired sibling. However, the handlebar is positioned closer to the rider and you have a slightly tilted-forward body posture, not completely upright like that on a commuter. The comfortable riding posture means that the Yamaha MT-15 is a much better option for touring on the highway and even commuting will be less stressful. However, the rider will face more windblast on the MT-15 as there’s no windscreen. While the rider’s seat has ample space and is well cushioned, the pillion seat is much smaller and doesn’t look pillion-friendly. At 810mm, seat height isn’t short, but it’s slightly lower than that of the Yamaha R15 -- and since the MT-15 is slimmer, shorter riders wouldn’t find it difficult to get onto. Talking about tech, the new Yamaha MT-15 is equipped with LED projector headlights. Given our poor experience with the R15 and the FZ25’s LED headlights, we are hoping that the new projector unit is better. Since the ride was held in the afternoon, we couldn’t test its effectiveness and we hope the new units are better-performing than its siblings. It also gets a petite LED unit at the rear. The all-digital instrument cluster is a straight lift from the R15, albeit with a negative LCD display. What it relays back to you is the usual details along with a gear position indicator, real and average fuel consumption, distance to empty and there’s also a shift light above it. The MT-15 is also the only naked motorcycle in its segment to feature VVA (variable valve actuation) tech. While the R15 features dual-channel ABS, the new Yamaha motorcycle gets a single-channel unit. Also, the aluminium swingarm seen on its faired sibling has been replaced with a box-type unit. Another major change compared to the international-spec model is the inclusion of telescopic forks instead of USD forks. Yamaha has also introduced some accessories for the MT-15, including a USB charger, mobile stand, and tank pad. You can read about it here. Powering the motorcycle is the same 155cc, single-cylinder, liquid-cooled motor seen on the R15. In fact, power output on the MT-15 is also similar at 19.3PS at 10,000 rpm and 14.7Nm at 8,500 rpm. It also carries forward the VVA (variable valve actuation) tech seen on its faired sibling for better mid and top-end performance. Yamaha engineers, though, have added four more teeth to the rear sprocket (52 teeth now) of the MT-15 and tuned the ECU map to suit its streetfighter character. Both these changes imply a stronger bottom-end performance than the R15. In fact, we feel it will be quicker to 60kmph than the R15 as it’s 4kg lighter as well. The engine tuning of the MT-15 is focussed on making it a better bike than the R15 for urban riding. However, Yamaha decided to keep the ride at BIC and on top of that gave us little riding time. Since it was a rolling start on the track, I couldn’t judge the low-end performance, but the MT-15 does have a strong mid-range. Given my heft and the lack of long straights on the twisty part of BIC, the top speed I could see was around 100kmph in 5th gear. 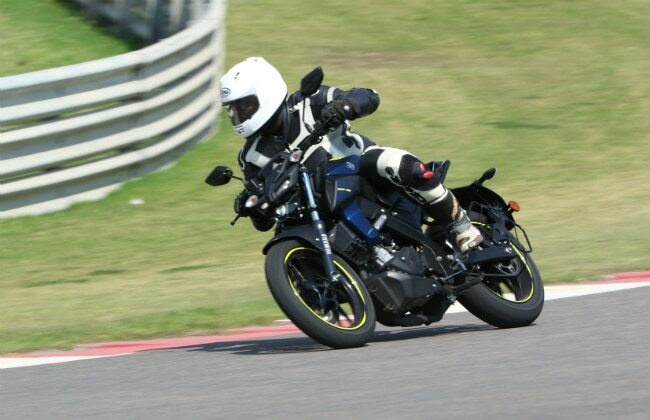 Throttle response is accurate and the strong mid-range meant that the MT-15 was accelerating out of corners swiftly. However, I shall reserve my comments on performance till we do a proper road test in varying riding conditions. The 6-speed gearbox on the MT-15 offers crisp shifts and it’s among the best transmissions in its segment. While a slipper clutch isn’t of much use on a entry-level performance naked, out on the BIC, it did make its presence felt in a positive manner. While the Deltabox frame and steering geometry is similar to the R15, the MT-15 features a box-type swingarm as opposed to cast aluminium, to keep costs in check. Despite the MT-15’s 10mm longer wheelbase, compared to its supersports sibling out on the track it felt even sharper tipping into corners. While quick turn-ins is a positive aspect, on the MT-15 it’s scarily quick and newbie riders will have to be extra cautious. Around the flowing sweepers and tight corners of BIC, the MT-15 remained unfazed; however the stock non-radial MRF tyres aren’t confidence-inspiring. And unlike the R15, Yamaha isn’t offering an optional Metzeler rear tyre on the naked bike. So if you’re into fast cornering, tyre upgradation should be on priority. While the braking hardware (282mm disc at the front and 220mm disc at the rear) is similar to its sibling, its performance isn’t on par. The MT-15’s brakes lack bite and sometimes even felt spongy. Another thing I noticed was that the braking was inconsistent and the bite started to fade after few laps on the track. The fact that it gets single-channel ABS doesn’t help its case either. The Yamaha MT-15 is available only in a single variant currently. The Japanese bike is offered in two shades: metallic black and dark matte blue. Unlike the blue colour sold in Indonesia, the MT-15 sold in our country doesn't get fluorescent yellow finish on the wheels; instead, we get a rim tape on the blue colour option. We do hope that Yamaha introduces more colour options and also a dual-channel ABS option in the future. A lot was expected from the Yamaha MT-15 and it does deliver on certain aspects. The updates made to the motor should make the new bike better to ride than the R15 in the urban environment. Also, the upright riding stance and aggressive styling will broaden its appeal. But the biggest drawback is its steep pricing. Given the lack of dual-channel ABS, aluminium swingarm and lesser body panels, we were expecting the bike to be priced around Rs 1.20 lakh. However, the Rs 1.36 lakh (ex-showroom, Delhi) pricing for the MT-15 is very steep and beyond explanation. In fact, it’s around Rs 3,000 cheaper than the R15 Version 3.0 and Rs 3,000 more expensive than the Yamaha FZ25, which is absurd. As you can see, the MT-15 faces competition from its own siblings and there are more competitively priced rivals from other brands. The “Dark side of Japan” has cast dark shadows on the aspirations of many prospective MT-15 buyers with its pricing.